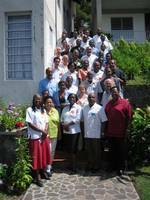 The WCC, in collaboration with the Caribbean Conference of Churches (CCC) and the Dominica Council of Churches (DCC), hosted it's pre-Assembly meeting for the Caribbean at the "Holy Redeemer Retreat House" in Eggelston, Dominica, 10-11 October. There were around 40 participants at the meeting, coming from 22 islands or states (Grenada, Jamaica, Suriname, Cuba, Antigua & Barbuda, Guyana, Trinidad & Tobago, Puerto Rico, US Virgin Islands, Anguilla, Belize British Virgin Islands, Curaçao, Dominica, Monserrat, Nevis, Panamá, St. Kitts, St. Lucia, St. Vincent & The Grenadines). We also had two WCC staff from Geneva. Since the Assembly is taking place for the first time in the Latin American region, the Caribbean churches were invited to "host" the Assembly as well - an invitation that was warmly accepted. The delegates were reminded that this global gathering would be an occasion to analyze critically how the churches and the ecumenical movement in general are changing and experiencing a "re-configuration". Gerard Granado, general secretary of the CCC, stressed the similarity of themes between the recent CCC assembly on "Healing & transformation. 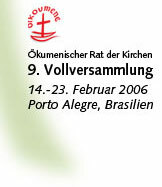 Given in Christ, fulfilled by the Holy Spirit," and the WCC Assembly theme of "God, in your grace, transform the world". need for a platform for inter-faith collaboration, mainly with Islam, Judaism and Hinduism. The Caribbean churches are bringing these major challenges to the Assembly, in order to address them with the global ecumenical family, for transformation by God's grace.